This team is playing outside of their minds right now, they are that stereotypical “no one wants to play these guys right now” team emerging from the depths of the NFC playoff picture. Pete Carroll is perhaps the Tim Tebow of the coaching ranks, as unconventional as they come and seemingly scraping something out of absolutely nothing to get it done when it matters most. No miracles were needed today though as the Seahawks rolled over the pitiful Chicago Bears and the defense obliterated the second half as Seattle scored 31 unanswered points after falling behind 14-7. 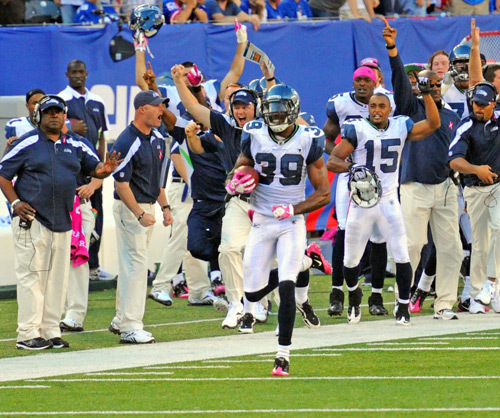 Brandon Browner continues to astonish me with his outstanding play. That Pittsburgh Steelers game is fully in the rearview mirror and he is beginning to emerge as not just a young talent but an elite player at his position. Have you forgotten about Marcus Trufant? Because I sure as hell have, and he’s one of the most accomplished players at my school and i’m saying that. Richard Sherman, who also had an interception today, has stepped up big as well. I really liked that selection in the fifth round and now he is firmly entrenched at No. 2 and I don’t see him going anywhere. At 6″4 and 6″3, the Seahawks easily have the tallest most physically imposing cornerback tandem in the entire league. In fact, the Seahawks may have the best, youngest, most talented secondary in the ENTIRE league. Those are bold words, but I struggle to find a combination of four players that are universally as young and talented as those four. In fact at 27 Browner is the elder statesman of the group. This defense has had me giddy from the start and they just continue to light up the field. As a whole unit, I think the bold statement can be made that there may not be a younger, more talented, and physically imposing defense in the entire league. They forced 4 interceptions and 5 overall turnovers, returning two of those interceptions for touchdowns, including one from defensive end Red Bryant in something that looked straight out of a Madden game. Anthony Hargrove, a seemingly silent acquisition, had a huge hit on Johnny Knox that forced a key first half turnover and has been an amazing role player for the Seahawks. Despite his limited snap count he has notched 3 sacks, 2 tackles for loss, and a forced fumble. Chris Clemons continued to dominate and embarrassed J’Marcus Webb in the second half with a pair of sacks. He has already matched his career best 11 sack campaign and his play is pantomime to the ever blazing swords at the end of the Scorpion King. He has firmly established himself as a premier top 5-10 caliber pass rusher and only continues to get better; that high priced dude named Julius Peppers on the opposite side of the field isn’t even playing up to his par right now. Seahawks fans should have their eyes glued to the ESPN Gamecast of the Detroit Lions and the Oakland Raiders and should be bleeding silver and black right now because the Raiders are winning 27-14. ALOT of good things happened for the Seahawks today, not only beating a leapfrogging the Bears themselves, but the New York Giants lost their game today as well, thrusting Seattle above them as well. They are now the team directly behind the Detroit Lions in the playoff race and if the Detroit Lions lose (they’re down by 11 with 7:30 to go), they will be sitting one game behind them. That means if Detroit loses one game against either the Chargers or Packers (uh oh, they’re going to be resting), and the Seahawks win out, the Seahawks would overtake the Lions in the playoff standings. It might be tough, but you need to become Dallas Cowboys fans as well because they need to win out and that would include a Giants victory. The worst thing that could happen is the Giants somehow winning the NFC East and bumping Dallas into the wild-card hunt. The Seahawks would be making history with another playoff berth as well. One season after making the postseason at 7-9 they would become the first team ever to rally from a 2-6 start to land a playoff spot. For the unconventional Pete Carroll, the impossible is fast becoming the norm. Expect a ridiculous playoff atmosphere in Seattle next week as the Seahawks look to cease laughing seizures when the NFC West is a topic of conversation. I don’t know how you can hate on a division that produces 2 playoff teams… Unless of course your one of those people who scoffs at Tim Tebows 7-1 record.